If you were at the Salute to Supernatural San Francisco convention in December 2016, you’re probably still immersed in the amazing memories made. We were there too, and guess what? We had a great time. How about you? Be sure to tell us about your Supernatural experience in the comments and check out our pictures below. Let’s take a moment to wax nostalgic over #SPNSF. At the start of the convention, attendees were greeted by Rob Benedict (Chuck Shurley/Carver Edlund) and the amazing Louden Swain. Richard Speight, Jr. (Trickster/Gabriel) didn’t arrive until Saturday because he was busy directing an episode of Supernatural. Though we didn’t get the Rules and Regulations, Rob held his own with the support of Michael “Robot Mike” Borja (bass) and the rest of the band. He is God, after all. The Creation Entertainment folks know how to schedule—giving us a dynamic first panel with Kim Rhodes (Sheriff Jody Mills) and Briana Buckmaster (Sheriff Donna Hanscum). The ladies discussed developing their comedic chops as actors, and even did impressions of each other’s characters. Kim and Briana announced they have plans to host a Thursday night pajama party at future cons to “hang out and be wayward as f*ck, and watch TV, and discuss why pineapple does not belong on pizza.” Something to look forward to in 2017. After the high energy of Kim and Briana, the audience enjoyed a mellow musical panel with singer/songwriter Jason Manns. Rob and Jason performed “Little Drummer Boy,” which is on Jason’s new album, Christmas with Friends. Jason talked about the project, which features a host of Supernatural actors including Jensen Ackles, Rob Benedict, Richard Speight, Jr., Jared Padalecki (Sam Winchester), Misha Collins (Castiel), and Julie McNiven (Anna) performing classic Christmas songs. Jason also performed with Rob and guitarist Bill Moran in their incarnation as the band The Station Breaks. After Jason Manns, we got a chance to run over to the It’s-It Ice Cream Factory, which is only a few minutes’ walk from the hotel. If you read our article about Life Outside the Convention Hotel, hopefully you did too. They were even offering free prizes for posting a picture on Instagram. Now you’re super sad you didn’t go, aren’t you? Friday afternoon the audience got to experience a Death panel with Julian Richings. As noted by one of the attendees, Julian was delightful! During his panel, Julian was funny, energetic, and engaging. He was still a fantastic bundle of energy and joy later that night at Karaoke. Who knew an actor who plays Death could be so vivacious? The last panel on Friday was with fan fave Osric Chau (Kevin Tran). Osric talked about the challenges of wearing costumes. When the band returned, Osric and Rob had a discussion about urinating while in costume. Osric couldn’t believe that Rob never had to pee while wearing a dress, though Rob did point out that Karaoke only lasts two hours. Rob promised to try peeing in a dress after Karaoke. After the panel we had a photo op with the wonderfully kind Osric while he was wearing his Gryffindor shirt. Love it when fandoms collide. The first panel on Saturday may have been our favorite of the entire weekend. Briana Buckmaster, Kim Rhodes, and Osric Chau returned to join Ruth Connell (Rowena), though most seemed to still be recovering from the night before. Their conversation touched on the transformative nature of Supernatural conventions, gender in Pokémon, their favorite boss *ss b*tch moments on Supernatural, and a whole lot more. If you’re going to watch just one video from #SFCon, we’d suggest this hilarious panel. Lots of talented folks participated in the costume contest. All the costumed kids were adorable, and we especially love seeing the toddlers and babies decked out. The costume that won the general contest was a well-attired Ash. We also loved the Sheriff Jody and Donna costumes, as well as Charlie Bradbury—girl power! An institutionalized Cas, who sat on the floor holding a game of Sorry, won the Castiel costume contest. We had time to run over to Max’s for a delicious lunch, and then took a walk along the waterfront to visit the Shorebird Sanctuary. It turns out we weren’t the only ones who enjoyed the water during the convention, as we later learned that Misha Collins took his meet-and-greet group down by the Bay. After lunch we were sure to get back to our seats on time because Mark Sheppard loves to taunt the attendees who arrive late for his panel. Mark received his own taunting when he got into a disagreement with a questioner who asserted that Crowley had said that soulless Sam would sell his brother for a dollar if he needed a soda. Mark claimed that Crowley never said that, but some fans eventually proved him wrong with some online evidence. Mark was in good spirits, talking about his family, drumming, and his appreciation of the fandom. As usual, Richard Speight, Jr., Rob Benedict, and Matt Cohen gave us a hilarious panel, even if Richard was a little short with some of the questioners. The panel included some great discussions, including Rob urinating in a dress, funny moments on set, and various shows they’ve worked on. Best of all, it ended with Matt giving the audience a sample of his karaoke lap dancing with Louden Swain guitarist Billy Moran. The Saturday panels ended with Misha Collins (Castiel). Misha talked about his disappointment regarding the outcome of the presidential election, and his continuing desire to try to find ways to make a difference. He also talked about his children, Richard directing him in Supernatural, and his character. Misha introduced attendees to the LOVE campaign, which Jared, Jensen, and Misha established to raise money for needy children and families around the world. Throughout Misha’s panel there were interruptions by crying babies, which ended up being freakin’ adorable. Leading up to the San Francisco con there was a question of whether Jensen would make it if his wife Danneel gave birth before the convention. It turned out that the twins arrived on Friday night, but with Danneel’s encouragement, Jensen still made it to the con on Sunday. At the Sunday morning gold panel, Jensen let the crowd know that Danneel and twins were doing well. Jensen told the crowd how hard it was to make it back to Austin for the birth when he realized he didn’t have his passport with him in Vancouver. 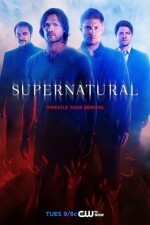 Jared and Jensen acknowledged that Richard Speight, Jr., who was directing the episode “Stuck in the Middle (With You),” helped them to get done filming quickly so they could make it back to Austin in time. Jared talked about Jensen’s anxiety during the lulls between filming. Jensen said that when things got slow he got on the radio and just said, “twins” in order to remind everyone to keep things moving. Ruth Connell has her own unique style with Supernatural conventions. She collects hotel toiletries to hand out to those who ask questions, though this time she had some bracelets to give out as well. This former dancer enjoys walking around and giving each person who asks a question a hug. Her accent may not always be easy to understand, but she is very kind. The most anticipated moment of any Supernatural convention is when Jared and Jensen appear on Sunday afternoon. You know how some people say there are no dumb questions? Those folks have never been to a convention. But in the end, it doesnʻt matter, because itʻs just about having fun. Jared and Jensen have the gift of generating an interesting response—often funny, sometimes heartfelt—to any question. Jared’s in-laws were attending the con, and his father-in-law, who looked a lot like Richard Gere, came onstage for some autographs. During the panel J2 talked about pranks (a favorite topic at conventions), Jared’s fear of bears, coping with anxiety, family traditions, and their characters’ development. We’re loving Kings of Con, so having a panel with Rich and Rob on their new web series was a special treat. They discussed how they developed the series and how their convention experience informs Kings of Con. R2 talked about their relationship—the comedic chemistry they have together, bonding moments at conventions, Rich talking Rob into stuff he’s reluctant to do (like showing side bottom on Kings of Con), and Rich making up rumors about Rob hating Perth. They’re a great comedy team, so having Kings of Con as the last panel was a terrific ending for the San Francisco Salute to Supernatural convention. See more photos from #SFcon below.